Here at HAP, we’re pretty big on finding ways to be sustainable, budget-friendly and fabulous all at once. So with Earth Day coming up on Thursday, we’re dishing up a full week of earth-friendly posts and we’re kicking things off with a great GIVEAWAY! 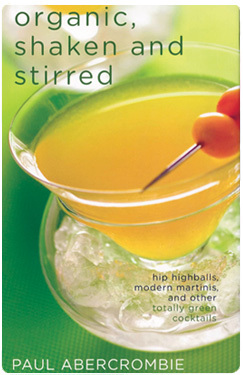 One lucky reader will win a copy of Organic, Shaken and Stirred by Paul Abercrombie, which is full of delectable cocktail recipes featuring organic ingredients and organic alcohols. To enter, just leave a comment telling us one thing you’re doing this year to be more eco-conscious and we’ll pick a winner this Friday. 1. Give us your one minute bio. I first became interested in mixology – beyond the teenage tippler’s sloshing rum into a half-empty can of Coke – during a trip to Italy. My then-girlfriend-now-wife Gail and I happened into the beautiful lobby bar of the Grand Hotel in Florence and asked the bartender to suggest a drink. “Negroni”, he said. At the first sip, we were hooked. Pleasingly bitter and sweet and tart all at once, Negroni was a revelation. For months after it was pretty much our house cocktail. Of course, this was the only grownup drink I knew how to make. I began to seek out recipes new and old, and fresher, better-tasting ingredients for cocktails. Eventually, I connected with West Coast mixologists who were among the first to emphasize organic fruits, vegetables, and even spirits in their cocktails. As soon as I tasted these drinks, I was hooked all over again. 2. How did you get interested in organic cocktails and what inspired you to write a book? My interest in organic cocktails was in many ways an extension of my interest in organic foods. As organic and farm-fresh foods began to take off some years ago, I noticed a disconnect at restaurants. Here you’d sit, enjoying a delicious meal of fresh, in-season foods, yet in the cocktail glass you’d be served the same pre-fab cocktail mix with Day-Glo cherry colored ingredients. I wondered why people didn’t care as much about what’s in your glass as what’s on your plate. Luckily, I began to run into mixologists such as Scott Beattie and H. Joseph Ehrmann who were already leading the charge to bring the kitchen into the bar. I began reaching out to them (read: pestering them). Soon it was a minor obsession. 3. Organic is a hot health topic but alcohol is not exactly “healthy” per se. Are there any health benefits to buying organic booze? Are they offset by the alcohol? 4. What’s your favorite “ingredient” to use when making cocktails? I’m really enjoying playing with organic ingredients typically found on plates or soup bowls – like rosemary, ginger and carrots. The sweetness and “carrotness” of an organic carrot is amazing. 5. For the home bar, what are 3 key bar tools and 3 key ingredients one should always have on hand? Without a doubt, my can’t-live-without bar gizmo is my OXO Good Grips Mini Angle Measuring Cup, which allows you to accurately measure ingredients without having to crank your head sideways to check your measure. Also, a good old-fashioned hand lemon/lime juicer. And ice. Don’t skimp on the ice! With only three ingredients – an alcohol, sweetener and some form of fresh citrus – you can make any number of sours, a foundational category of cocktail that’s sort of the equivalent of rock songs built on three chords. Simple, but great. For example, a margarita is tequila, agave nectar and lime juice. A daiquiri is rum, simple syrup and lime juice. Once you get the hang of sours, introduce new ingredients such as elderflower liqueur or muddling in an herb. Don’t be afraid to deviate from recipes. If you like more or less sour or sweet in a drink, that’s the right way to make the drink – for you. In a cocktail shaker, muddle the blueberries, 3 thyme sprigs and simple syrup until blueberries are mashed. Add vodka, water, elderflower liqueur, lemon juice and Chartreuse. Fill shaker with ice and shake vigorously. 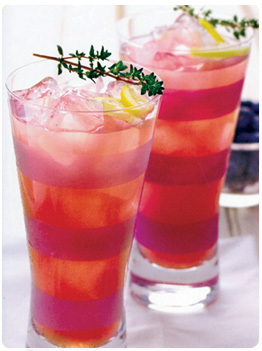 Strain into a tall glass filled with ice and garnish with the remaining thyme sprig. * To make simple syrup, combine 1 C organic sugar with 8 oz water in a small saucepan and bring to boil. Reduce heat and stir until sugar is completely dissolved. Remove from heat and cool. Syrup can be refrigerated in an air-tight container for up to a month. What am I doing this year to be more eco-conscious? I’ve joined a CSA that will supply the majority of our food: eggs, meat, veggies, fruit, bread, milk and cheese! Everything is produced locally which is great for the environment, not to mention all the nutritional benefits! The cocktail book looks great – I love that Paul is into organics! 1) No shopping without re-useable shopping bags! I am really getting into recycling everything I can and using reusable bags for everything. I even have a small fold up one in my purse at all times for when I stop into stores that I might not have been planning on stopping in. My new objective around the house is to use less chemicals. I asked for (and received!) a floor steamer for my birthday. It cleans floors naturally and sanitizes them using only water….no cleaners!!! So far so good…I love it! We are going with a group of people to do a beach-cleanup! We also recycle almost EVERYTHING! We recycle, of course. We drive a hybrid car. And, I always try to remember to bring canvas bags into the store with me. Childrearing is a HUGE place where we can all be a bit more greener! I cloth diaper and make my own baby food. I recycle everything I can, do a CSA, use biodegradable dog waste bags, but my new plan is to install a rain barrel this spring! Let us know how your rain barrel goes! My neighbors have one and I’m definitely intruiged! i love that everyone is posting ways to be more green! very inspiring…. – last week we installed two rain barrels, and have them positioned at both the front and rear of our house to (hopefully) provide summer watering for all of our plants. – i always use canvas bags when grocery shopping. – have spent the good part of motherhood drilling into the kids’ heads the importance of turning off a light when leaving a room, as well as turning off the faucet when brushing their teeth. – planting a veggie garden with the kids. not only do they help out, but they love eating their own grown stuff! – walk with kids to school and other local businesses, and bike if they’re a bit farther away. – reduce, reuse and recycle!! We’re a one-car family! It’s a challenge in LA, but you’d be surprised how easy it is to share. My husband bikes to work many days, which is a great way to get some exercise too. When he takes the car, I can walk to the bank or Whole Foods. It just simplifies, greenifies, and cheapifies our lives!